What Showing Class should I enter? I get asked this a lot when it comes to riding horse and hunter classes. 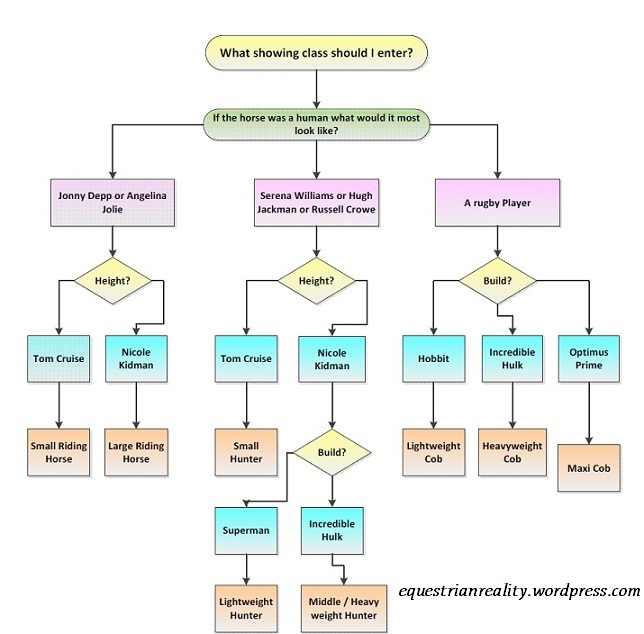 The following diagram might help…..
Posted on July 8, 2013, in General, Showing and tagged cobs, equestrian, equestrian humour, equestrianism, horses, Humour, hunters, ireland, irish equestrianism, lightweight hunter, show horse, showing, showing class, showing classes, small hunter, what showing class should i enter. Bookmark the permalink. 4 Comments. How fun! And interesting :). Love your spin on this L, have to say you gave me a hilarious mental image of Nicole Kidman-Incredible Hulk style!